Humans respirate Volatile Organic Compounds (VOCs) as well as CO2. The BAPI sensor measures these VOCs as they build up in a room just like a CO2 sensor does. The advantage of the VOC sensor is that it measures air contaminants from other sources besides respiration, such as building materials, cleaners, perfumes and furniture and carpet off-gassing. Using this sensor for Demand Controlled Ventilation then is a way of achieving true indoor air quality, rather than just CO2 dilution. A further benefit is that it requires no additional work on your part. That’s because the unit outputs a CO2 equivalent level, letting you use Ashrae’s CO2-based VRP schedule to ventilate. The BAPI-Stat 3 VOC Sensor is available as VOC alone or as a combination temp and humidity sensor with temp setpoint and override. Indication of the VOC level as “Good, Fair or Poor” is available as a 3-color LED or as an arrow on the LCD. Be the first to review “VOC Room Sensor, BAPI-Stat 3 Enclosure” Click here to cancel reply. 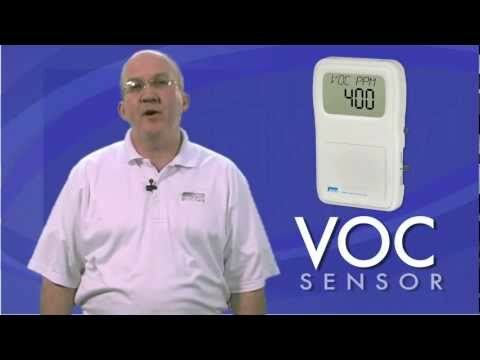 An overview of BAPI's Volatile Organic Compound (VOC) sensor. Even though CO2 sensors are the most commonly used used for Demand Controlled Ventilation, they ONLY measure CO2 and ignore all the other contaminants which may be in the air such as the off-gassing of building materials, furniture, carpet, paint, cleaners or solvents to name just a few. These are some of the most harmful indoor air contaminants, and BAPI's VOC sensors detect them and thousands more, allowing you to ventilate them away before they can affect the health and productivity of the people in the building. A CO2 sensor simply can't do that. 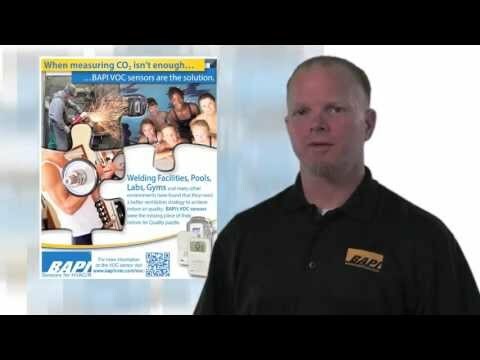 One of the best things about BAPI's VOC sensors is that they're as easy to use as a CO2 sensor. That's because the output has been converted to CO2 level, letting you use the Ashrae's CO2-based algorithm to ventilate. Besides being an alternative to CO2, BAPI's VOC sensors have proven to be effective in buildings and locations that have specific indoor air quality needs. For instance, the BAPI VOC sensors detect chloramines in indoor swimming pools, welding byproducts at fabrication facilities, formaldehyde and other chemicals in laboratories and even human sweat -- or body odor - in gyms and exercise centers. The list is nearly endless.